Chancellor George Osborne has surprised critics by doing a U-turn on tax credit cuts and vowing to protect police budgets in his Spending Review. Millions of low paid families will not now see their benefits cut in April, although the relief for many will be temporary because tax credits will be phased out by 2018. The new Universal Credit that will replace them is set to be less generous, critics say. Mr Osborne also pushed ahead with £12bn cuts to the welfare budget, with a fresh squeeze on housing benefit - and £20bn in departmental cuts. For Labour, shadow chancellor John McDonnell said Mr Osborne had "betrayed" voters by failing to eliminate the deficit and get debt falling. He stunned the chancellor - and many on the Labour benches - by brandishing a copy of Chairman Mao Tse-tung's Little Red Book and quoting the founder of communist China during his response to Mr Osborne's Spending Review. "Let me quote from Mao, rarely done in this chamber, 'We must learn to do economic work from all who know how'," the veteran Labour MP said. 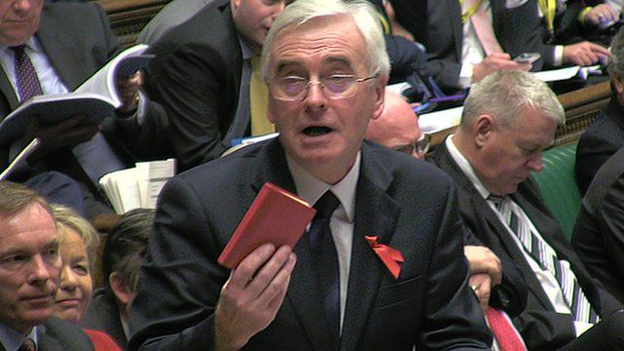 The moment John McDonnell pulled out Mao's "Little Red Book"
Amid roars from Conservative MPs, Mr Osborne said: "So the shadow chancellor literally stood at the Despatch Box and read out from Mao's Little Red Book." Mr McDonnell later told BBC News he had been using "humour" to make a point about Mr Osborne selling off UK assets to the Chinese. The chancellor was forced to rethink plans to cut £4.4bn from tax credits for low paid workers from April, after they were rejected by the House of Lords. Rather than phasing the cuts in, as he had been expected to do, Mr Osborne said he said he had decided the "simplest thing" was "to avoid them altogether", even though it would mean missing his own target for overall welfare spending in the early years of this Parliament. 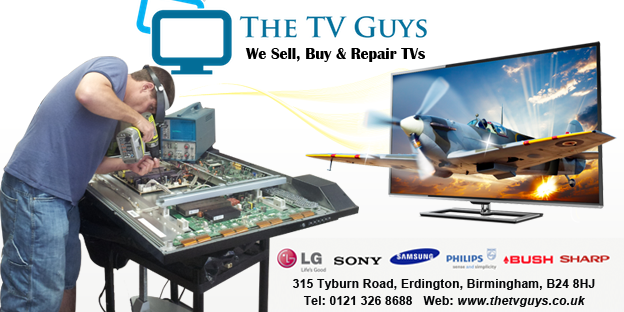 He said higher tax receipts and better public finances had enabled him to make the move. The surprise decision not to cut police budgets - amid security concerns sparked by the terror attack in Paris - was met with disbelief and "euphoria" among senior officers, according to the BBC's Danny Shaw. The lucky chancellor. Neither the slasher, nor the saver, but a politician who has found good fortune and surprisingly so. The official state of the country's books is remarkably improved, in just a few short months. So, George Osborne has for now, not just enough room to wriggle, but to make big, dramatic moves. And with that comes steady progress in his pet political project, pulling the Conservative Party to the centre of politics. SNP Treasury spokesman Stuart Hosie said Mr Osborne's "complete and humiliating U-turn on tax credit cuts shows that we were right to keep the pressure up to the last minute" for the cuts to be scrapped. But Paul Johnson, of the Institute for Fiscal Studies, said the move would change nothing in the long run because the cuts would still feature in the new Universal Credit system, which is due to replace tax credits by 2018. For Labour, John McDonnell said Mr Osborne's handling of tax credits had been a "fiasco" and cuts being transferred to Universal Credit meant "this is not the full and fair reversal that we pleaded for". Labour has calculated £3bn will still be cut from benefits for families during the course of this Parliament. 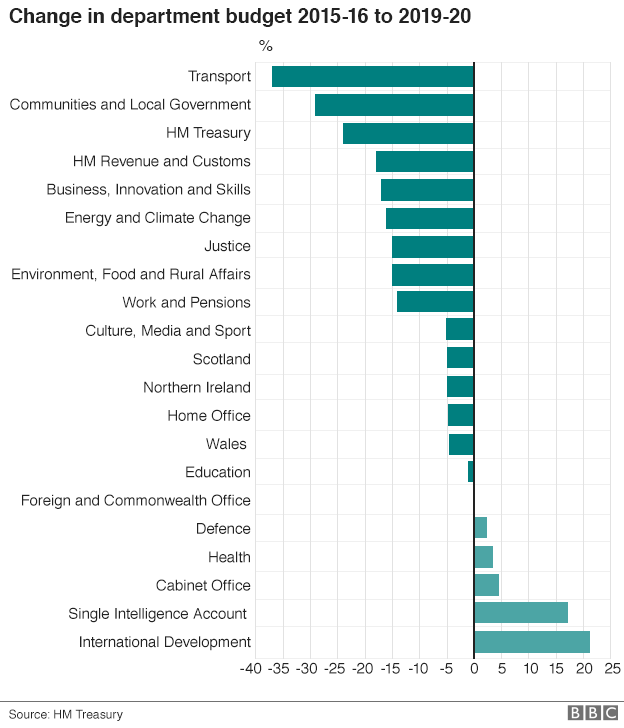 A string of government departments will have to find double-digit savings in their running costs and local government is in line for further big cuts. although local authorities with responsibility for social care will be allowed to levy a new precept of up to 2% on council tax. Ten police and crime commissioners will also be given greater powers to raise council tax bills. Analysis by the Office for Budget Responsibility suggests householders are set to pay £2.7bn more in council tax by 2020/2, despite a Conservative manifesto promise to help keep council taxes low. Mr Osborne told MPs the Spending Review was designed to make Britain "the most prosperous and secure of all the major nations of the world" and that "economic and national security" were at the heart of his plans. 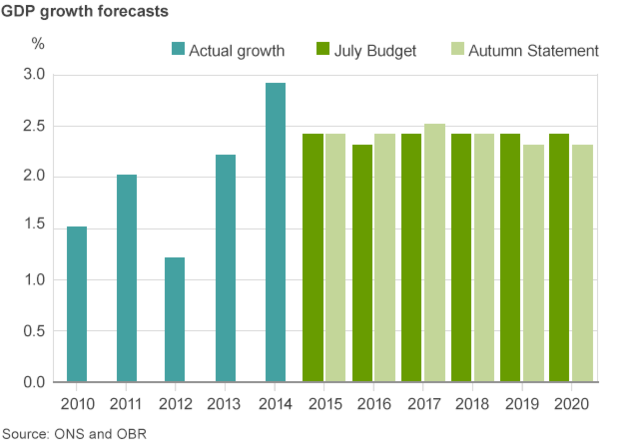 With higher tax receipts and lower interest rates predicted, Mr Osborne was able to announce that he would hit his target for running a budget surplus by 2020 - there had been speculation he would be forced to move the target back. 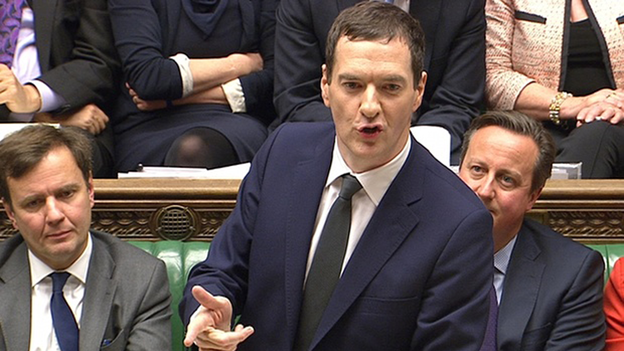 The chancellor told MPs solving the housing "crisis" was his top priority. In a shift away from free market solutions, Mr Osborne announced plans to hand £2.3bn directly to developers to build "starter homes" for first-time buyers, in a fresh attempt to reverse the long-term decline in house building. He will also pump £4bn into shared ownership schemes to provide more properties for households earning less than £80,000 (or £90,000 in London) who want to get on the housing ladder. The Treasury is calling it "the biggest affordable house-building programme since the 1970s" but Labour dismissed it as more rhetoric, saying: "If hot air built homes, then Conservative ministers would have our housing crisis sorted." The Treasury has already announced that front-line NHS services in England will get a £3.8bn, above-inflation, cash injection next year, as part of an £8bn real terms increase over the course of the Parliament. Defence spending is to be increased, as set out in Monday's Strategic Defence and Security Review. International aid will also escape cuts.